Botanical Name: 1. Lonicera japonica Thunb. L.; 2. Lonicera hypoglauca Miq. ; 3. Lonicera confusa DC. ; 4. Lonicera dsystyla Rehd. Common Name: Honeysuckle flower, Lonicera flower, Japanese honeysuckle stem. Part Used & Method for Pharmaceutical Preparations: The flower buds are gathered in the beginning of summer and dried in the shade. Meridians: Lung, stomach and large intestine. 1. Febrile diseases: a) exogenous pathogenic heat at the defensive and qi levels manifested as fever, thirst, slight aversion to wind and cold and sore throatHoneysuckle flower (Jinyinhua) is used with Forsythia fruit (Lianqiao) and Arctium fruit (Niubangzi); b) exogenous pathogenic heat at the qi level manifested as high fever, extreme thirst and surging, big pulseHoneysuckle flower (Jinyinhua) is used with Gypsum (Shigao) and Anemarrhena rhizome (Zhimu); c) exogenous pathogenic heat at the nutritive and blood levels manifested as maculopapule that appears as a dull, deep red and dry tongue, irritability and insomnia. Honeysuckle flower (Jinyinhua) is used with Moutan bark (Mudanpi) and Fresh rehmannia root (Shengdihuang). 2. Boils, carbuncles and furuncles. Honeysuckle flower (Jinyinhua) is used alone or is combined with Dandelion herb (Pugongying), Chrysanthemum flower (Juhua) and Forsythia fruit (Lianqiao). 3. Toxic heat diarrhea. 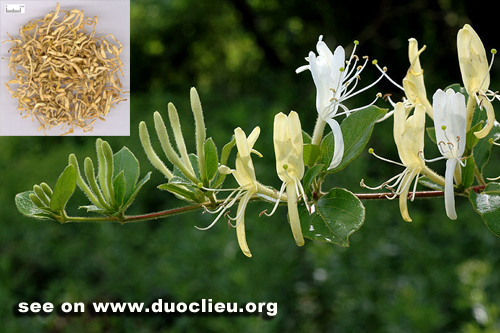 Honeysuckle flower (Jinyinhua) is used with Coptis root (Huanglian) and Pulsatilla root (Baitouweng). Dosage: 16–20 g, decocted in water for an oral dose, or macerated into wine for drinking. Cautions & Contraindications: This herb can be applied externally. The tender stems of lonicera japonica thunb have properties and taste similar to that of the flower, and are gathered in autumn or winter. The combination of Honeysuckle stem (Rendongteng), Forsythia fruit (Lianqiao) and Dandelion herb (Pugongying) is indicated for boils, carbuncles and furuncles. The combination of Honeysuckle stem (Rendongteng), Mulberry twigs (Sangzhi) and Chaenomeles fruit (Mugua) is used for wind-heat-damp arthralgia manifested as red, hot, painful and swollen joints with motor impairment. The dosage for medical use is 16-20 g.